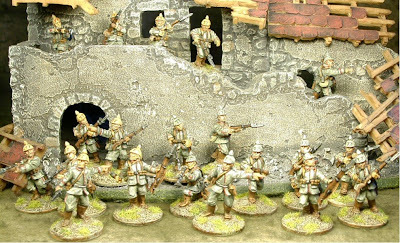 I managed to finish two platoons-worth of early-War German infantry this weekend. These are Old Glory figures. Not the most beautiful sculpts, but not bad at all for $0.87 a figure. Several are actually pretty nice, the officer, NCO, and a couple of others look okay. There are 10 figures per bag, all in different poses, so the variety is good for skirmish gaming. I opted not to go the "dip" route - yet again. I was afraid the red-piping would be lost. I used Vallejo Field Gray, mixed with white for their uniforms. To help ID the two platoons, I chose to paint their helmet covers in different colors. One in Vallejo Green Ochre, the other Field Gray. Regimental numbers on the covers were initially in red, then green, and finally left off entirely. The jackets on the figures didn't have their Bavarian cuffs sculpted, so I just painted them like they were. There were at least three different versions of the jacket throughout the war, this is the earlier version which was still worn until the end of the war. The weapons are okay, but the bayonets look stubby next the French ones. I believe this is based somewhat historically, as the French bayonets were longer & supposedly reflected their fighting spirit - at least in the first few months of the war. For the flesh, I tried a flesh wash called "Formula P3" which I picked up at the corner Games Workshop; I wasn't happy with it - ended up having to drybrush over it, as it ended up a dark pinkish-brown stain. Vallejo Ink/Stain has a nicer tone IMO. I noticed in the pictures above, that the red numerals on the Green Ochre helmet covers look green. Here's a picture to show that the numbers are actually red - don't know why they came out looking green. Below is a period illustration of various arms of service early in the war. 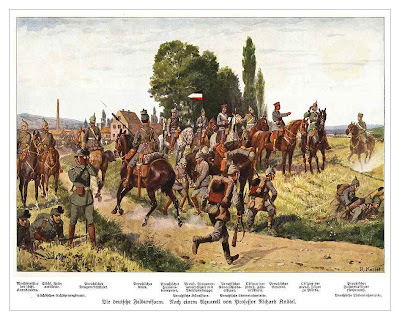 There are Jagers and infantry in the foreground, with cavalry and staff in the background. I plan to order some Great War Miniatures Jagers & MG team - especially since shipping should be free if I indicate they'll be picked up at Enfilade, courtesy of Bruce Meyers. I also have some late-War German Trench Fighters. These are the figures that actually got me into this period. The WHH Great War rulebook is a nice match. Now, I need to get back to the French Poilus. I'm not going to use the "Dip" on them either. Maybe this weekend; after I replace our kitchen faucet; oh, and rake out the moss in the backyard. Finally got around to slapping some paint on these guys. So far, only the flesh & Horizon Bleu uniforms on the French. I plan to give them the Mini Wax Tudor stain treatment. I've only tried the "dip" method once; and it was with a homebrew mixture of Future floor wax and some added "stain" - I was not impressed with the results. It may be that my mixture was flawed, so I will give the Mini Wax a shot. Since I understand the stain will darken the finish, I have tried to use colors that are slightly lighter than what I actually want as an end finish. I added white to the Vallejo Medium Flesh. The Horizon Bleu is a mix of the colors you see in the background of the photo. Americana True Blue & Neutral Grey, with Ceramcoat White. I used these colors as they are what I already have; you could probably use any blue-grey mix for this blue. I read that the uniform quickly faded to a light bluish-grey. Although I thought I started out with a light shade, I ended up dry-brushing a lighter second coat with more white added. They are actually a bit more of a baby-blue in-person; the picture is a bit washed out with the lighting. I hope the stain doesn't darken the finish too much - I'm hoping it'll just highlight stuff like belt straps & the puttees (the cloth bands on their lower legs). 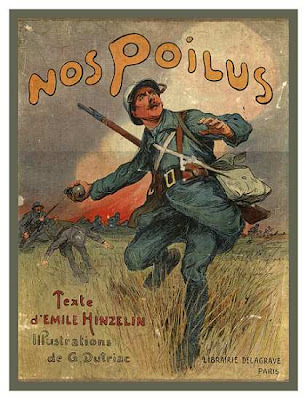 Here are some reference images for the Poilu's uniform - Poilu - "The Hairy Ones" - not sure if this nom de guerre enhanced their reputation at the time or not. I also have a great WWI uniform reference book, "Heraldry & Regalia of War" - I had a copy of this book as a kid, but gave it to my Brigade Sergeant Major, of all people, when I was stationed in Korea over 20-years ago. He had borrowed the book from me a couple of times, and I knew he liked it so I gave it him as I wasn't so interested in it at the time. I recently managed to get one off of eBay for less than $5 including shipping. Ha - timing is everything. 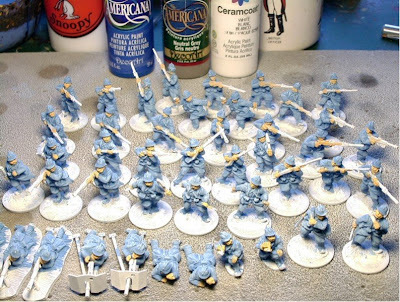 I'll probably paint the Germans the same way (Feld Grau for the uniforms) next, before I paint the webbing & weapons. I have a bottle of Vallejo Fieldgrey from the WW2 German paint set I bought awhile back. Ha, it's nice of them for using the same color for both wars. I'm not painting eyes or anything like that for these guys. I want to be able to get these guys ready for gaming - not close-up photos. Here are some pics of the old Foundry Napoleon & Staff set. I picked it up at last year's Enfilade for $10 (another went for $8 later in the day). Not sure how they will be used for wargaming - maybe something for the enemy to capture. The Napoleon figure is from a famous painting of him at Borodino. More non WAB-proper news; sorry, but I'm bitten by the "Side-Projects Bug." At least the ruleset for this is WHH's Great War rule book. I'm not in the habit of taking, much less posting, pics of unpainted lead, but I feel obligated to keep this blog alive. 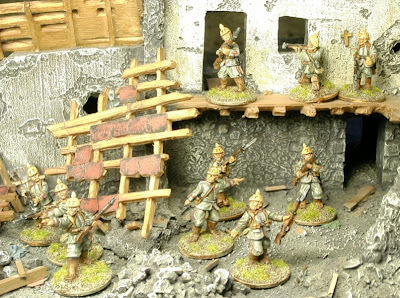 So, without further ado, here are some pics of the what will be some core-units for Great War games. First up, a platoon each of assault troops for the French & Germans; these are Old Glory "Trench Fighters" packs. In the back is an A7V (or as we like to say when we've had too much schnapps, Allgemeines Kriegsdepartement, 7. Abteilung, Verkehrswesen) German tank, also from Old Glory - I moved the exhaust pipes to where they're located in most pictures I've seen - Green Stuff'd the originally molded slots for the pipes. I also cut the track skirts a bit; they were rounded at the bottom - again, to conform to the pictures of the "real thing." Next, the "Hairy Ones" - Old Glory Poilus. The poses are quite animated; which suits the rules just fine IMO. Old Glory doesn't make WWI French in the early uniform (the one with kepis & red trousers). Which is okay, since I like the Horizon Blue uniform too. This a about a company's worth, including 37mm support guns and Chauchat (pronounced 'show-shah') LMGs. Finally, some Old Glory German "Reservists." I know the Stahlhelm replaced the Pickelhaube in 1916, but I really like the look of the older uniform. This is about two platoon's worth of infantry. The officer & NCO fig are particularly nice. I plan to add some Jaegers from Great War Miniatures. I'll post an update when these guys get some paint slapped on. Heh, heh, yeah I spelt it in English. 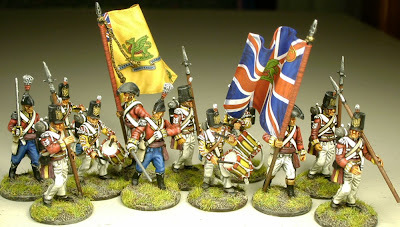 Anyway, here are some pics of my recently painted Victrix British. Ready for some Sharp Practice. Actually waiting for the release of the Victrix French as OPFOR. I know, I know, you're thinking what does this have to do with WAB. Well, it's basically kept me away from WAB a bit. However, I do have some Crusader Thracians ordered to flesh out my Macedonian light infantry/skirmish troops; as well as some more Old Glory WWI French & Germans for WHH Great War. So I have not given up on WAB by any means. Back to these Victrix chaps. Very happy with the end result. I ended up basing them on metal washers. I was hemming and hawing over basing them in groups of four or singly. I pretty much have all my foot figures based singly for WAB, so this probably carried over into these Napoleonics. I just like the option that they can be moved around in tighter areas singly. They are supposed to be the 3rd Foot Regiment, aka "The Buffs." I may have used too much yellow for the facing colors though. This unit earned much honors in the Peninsula. Although they were decimated at the battle of Albuhera when overrun by several French cavalry units, they never lost their colours, but at great cost to one indomitable Lieutenant Latham. They even went on to take part in the invasion of New York in 1814. Speaking of the colours; beautiful as they are, I found them a bit tricky to fit on. I notched them a little where they attach to the poles. They could probably have been a millimeter or two smaller for an easier fit. Just a suggestion and not a complaint; as it is very cool that they are included in the set to begin with. There is actually another set for the 59th Foot; but I didn't want to paint white facings.